The following have been taken from my earlier posts. Dear Sir, It gave immense pleasure for me to visit your website. I was always amazed to know about the community and the culture. I am a Non Badaga and married last Dec to a Badaga from ………..
And Recently on the ….. of this month I gave birth to a baby. My husband and my in laws want me to learn Badaga as I have to talk to the baby in Badaga for her to pick up the language. Please help me learn the language by sending me some day to day conversations . Thanks a lot for your email. I am delighted to learn that you find my website[s] interesting and informative. 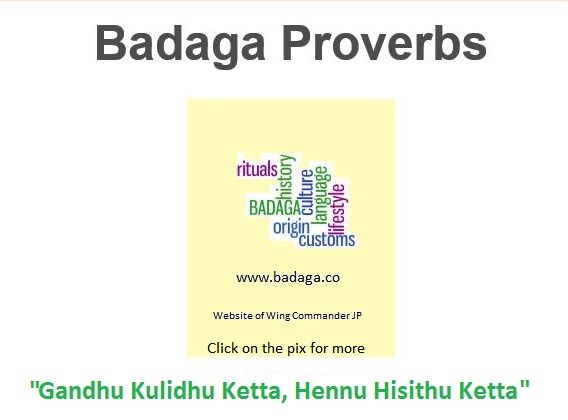 I have given a few ‘lessons’ about LEARN BADAGA in my websites/blogs. …. When you meet any elder, especially your in-laws and hubby’s grand parents, bow your head and say, ‘Kumbidichivi – meaning bless me. They are expected to touch your head and say, “Badhukku” – long live. You will find that any elder Badaga will be thrilled with this gesture as many do not follow this wonderful custom and your day will be made. As a new mother, for about 40 days after delivering a baby, you are a ‘baththya hemmathi’ with some diet and other restrictions. “Hosa koosuga, ondhu muthu kodu’ – give the new born baby a kiss. The following sentences are meant to address elders with respect. [Like in Tamil – instead of Nee it is Neengal when we talk to an elder]1.How are You – Ollenge [ஒள்ளெங்கெ] idhara?2.How is your health? – Ninga Sogava idhara / odambu ollenge hadadhaiya? 3.How is the weather? – Seemey ethey hadadhey? 4.what did you eat for breakfast/lunch/dinner. – Orakkadhu [morning] / Hagalu [afternoon] / santhu [evening], aena hittu thindhi? 5.Would you like to have some tea? – Josee Tea kudithaariya ? 1. 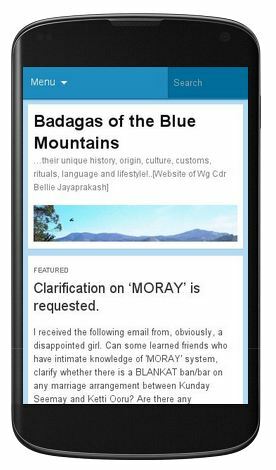 Are you a Badaga ? – Nee ondu Badagana? 3. What is your name ? – Ninna hesaru aena ? 5. Which is your village ? – Ninna Hatti edu ? 7. Whose son/daughter are you ? – Nee dara maathi / hennu ? It is said that Badaga month usually, starts on every 10th of the English month. Like for example the first Badaga month Koodalu starts on 10th January. Certain peculiarities of Badaga . Hallu [ ha- as hurt and llu – as in loo] means tooth [teeth]. note – there is no plural term. Room aekka ethe GIJI GIJI (ya) hadadhe ? – Why is this room in such a mess? Amme Ekka maathaduvadu elle ? – Why is sister not talking ? Heddakku (Back of the skull) – usually Badagas have a long heddakku as they donot use cradles. The reason for not using cradles for babies is a story by itself. It is due to the fact that when they left Mysore to escape from the King (Thipu Sultan ?) in the night in a hurry, they had forgotten the baby which was sleeping in the cradle,each thinking that the other person wiould pick up the child. 637,392 visitors so far! Thank you. Appara Santhosha!